Wonderful venue located a short distance from Florence, capital of the art in Tuscany. The villa is surrounded by a charming garden with panoramic view over the city, it is perfect as frame for the fire and light shows. In order to give to better enhance our shows, we need an adequate space that frames every movement of the artists in the best possible way. The search for such a wonderful scenography can be said to be over if you think of the splendid Villa di Maiano. Despite being located a few kilometers from Florence, it is surrounded by a lush and well-kept garden overlooking the Florentine hills. It is this large park that makes the villa a perfect location for events of all kinds that aim to remain in the memory for a long time. 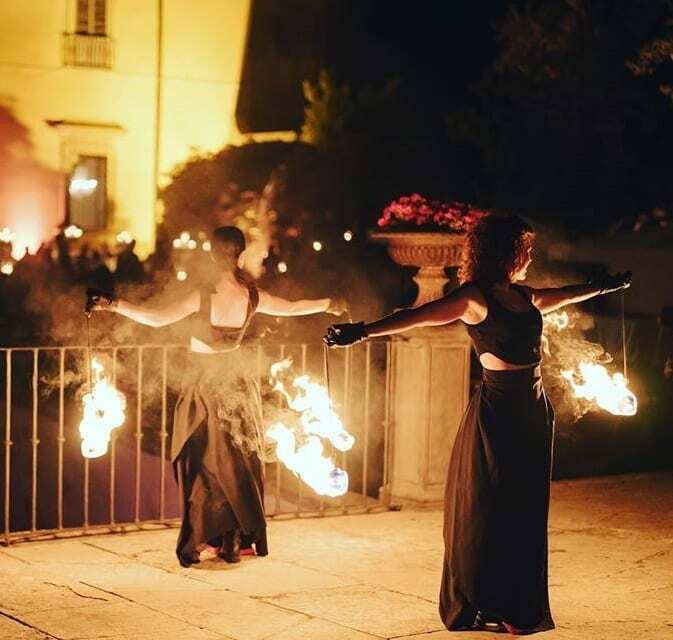 At Villa di Maiano there are numerous spaces suitable for a performance with fire. However, the best background to appreciate and enhance the beauty of this element is certainly the garden terrace from which you can admire the wonderful panorama of the city of Florence. This way, one of the capitals of Italian art becomes the background of our show, shining like a star behind us. When the show begins, the heat of the fire and the magic of its effects combined with the choreography staged by the artists of Lumen Invoco will ensure unforgettable moments. 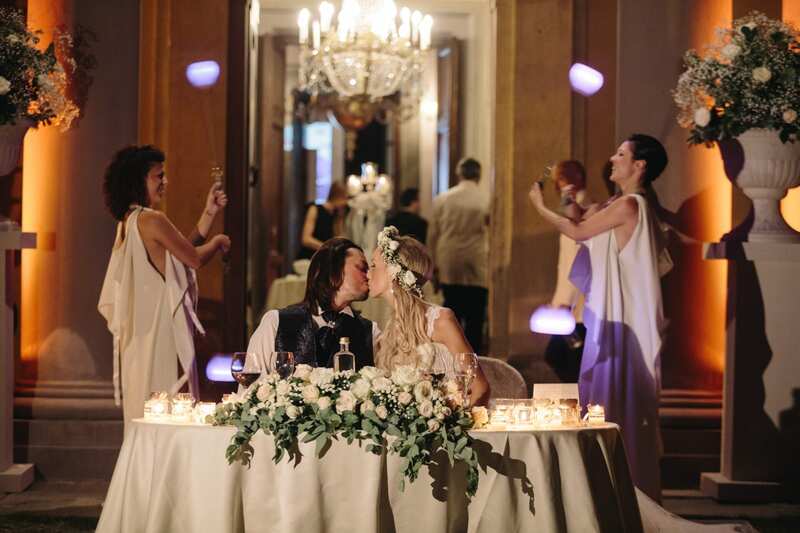 The energetic pyrotechnic finale will then create the right atmosphere to witness the most important moment of the evening: for example, the cutting of the cake during a wedding. The Villa’s ballroom, often used for the DJ set, is another ideal setting for our entertainment. 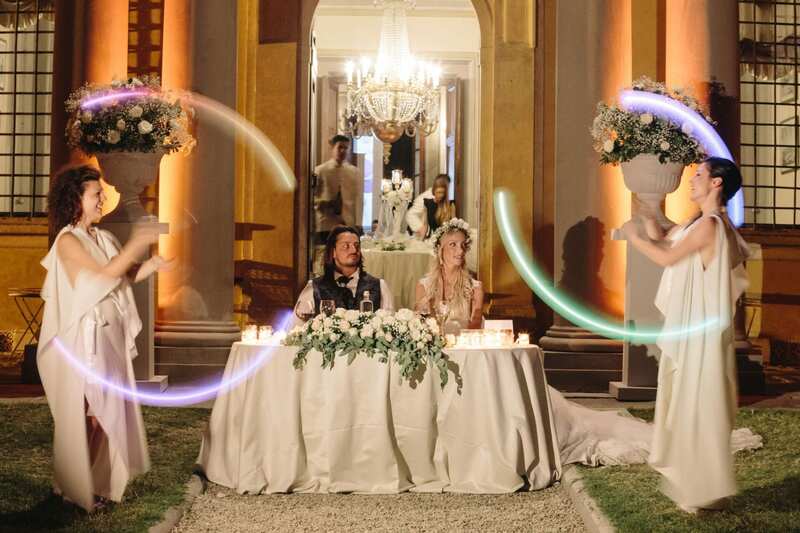 Here we can stage led shows that with their light trails create a colorful background for the first dance of the couple or to accompany all guests in the dances.